ahem. i saw this happening last month, and i mulled it over considerably. suzy at hip mountain mama and tons of bloggers are engaged in one small change to reduce environmental impact. i am all for it, and we already do a lot. making another shift was actually a little intimidating. we use cloth diapers only. we even use recycled wool sweater diaper covers. we compost, we worm-bin, we garden. we don't have any plastic toys. 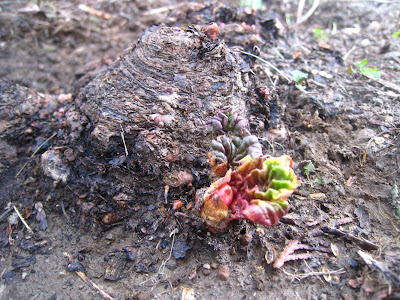 look; our rhubarb is already sprouting - spring is coming! this month i sent the last of my polyester out the door (saving a few that i handknit before i knew any better). in case you didn't know, it's made from oil (like plastic). after slowly culling synthetics from my wardrobe over the past few years, i've now developed a sensitivity to it. a rashlike one. yikes. however, i do run across plenty of linings when reclaiming woolens, and rather than toss those in the landfill, i've recently decided to save the scraps for stuffings that won't matter too much. like a gigantic cushion. it doesn't feel good to reclaim and rewaste. so if i claim the lining, i'd better use that too. 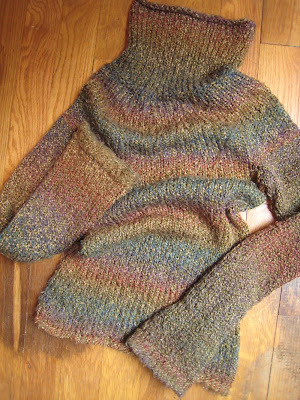 the first sweater i ever knit. i can't wear it, but i can't let it go (yet). here's the topsecret pattern. we were blessed with horrible colds on jan. first, and for lack of wanting coffee, we were given the opportunity to give it up. so be it. tea drinkers now, it occurred to me pretty quickly that it would be very sensible and ecologically friendly to never buy another tea bag. so once ours are gone, it's all loose leaf. it may not be much, but i think this added consciousness will infuse my tea drinking with more meaning (and less staples). 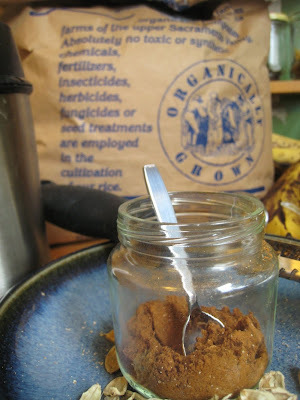 my version of chai concentrate; dairy-free sugar-free (we use coconut milk and honey). my mom started making this stuff a long time ago...i think her recipe even uses a smidge of black pepper for spiciness. yum. we also belong to a food buying club here in portland, and we get the opportunity to buy local and organic in bulk with neighbors, thereby reducing our cost and our packaging. we bought our first 25 lb. bag of organic sushi rice this month (behind the chai). this ought to make my desired change for february easier: no more plastic baggies at the store. i'll whip up some fabric drawstrings for leafy greens, and we'll continue to reuse the ones we have for what we feel or find we need to. kyce e-mailed me this pdf which will help us care for our food. and i will finally clean out the refrigerator.